This is one of a series of Q&A articles with East Kingdom Officers. The Gazette thanks Baroness Doucette de Verdun, the Kingdom Marshal of Equestrian Activities, for answering our questions. It’s the combination of two of my favorite things! For a long time, I didn’t combine my horse world with my SCA world – there were no equestrian events in my region and I didn’t think of it. 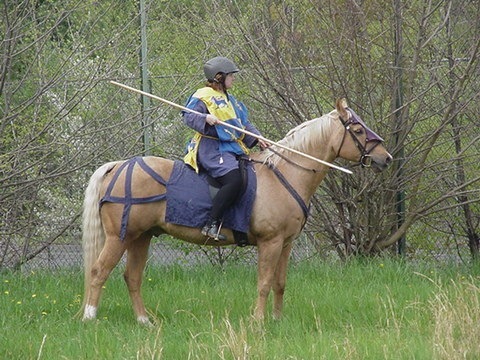 But when my horse became injured and I started using some of the SCA Equestrian games for his rehabilitation, I started to get involved, and it is now my favorite type of riding competition to do. I still ride in some mundane competitions, but SCA Equestrian events are now my first priority. This is my first round as a Kingdom officer, so my number one goal for my term is “mess nothing up”. I have some likes… I’d like to see equestrian activities in Tir Mara. I’d like to see more new equestrians. Most of all, I’d like to see our equestrians and participants and spectators have fun, leave smiling and want to do this more often. That would be success. I actually recruited my regional deputies before stepping up, and I took the extra step of recruiting a new position, a Deputy in Charge of Minors. Horse activities carry a lot of liability concerns, and sometimes those concerns get in the way of us letting our most enthusiastic riders (the littlest ones) get up and ride. I want them to be able to ride, and I felt the issue was important enough. My first event was Pennsic 31. My friend was a garb merchant, and she said “Come along with me on this annual camping trip I always go on, you need a break. Just one thing, you have to wear what I tell you to.” That was a week of surprises, to say the least! I stayed, as I continue to stay, for the people. I love my SCA friends and the broad range of people I meet. And the East Kingdom Equestrians are some of my favorite people! The East Kingdom Equestrian Marshals are terrific people and they’ve had such an amazing effect on my life. From the moment I walked into my first Equestrian Annual Meeting at Birka, I was hooked. Each and every one of them has taught me important things, and their influence has improved my life in every aspect from self-reliance to career development. I am still privately amazed that they are allowing me to be Kingdom Marshal of Horse – it’s a huge compliment coming from them.